Once you discover all you can do with your TI-83 Plus Graphing Calculator, you’ll find out how to make it do more! This guide shows you how to download and install the free TI Connect software to connect your calculator to your computer, and how to link it to other calculators and transfer files. It shows you how to help yourself to more than 40 applications you can download from the TI Web site, and most of them are free. You can choose from Advanced Finance, CellSheet, that turns your calculator into a spread sheet, NoteFolio that turns it into a word processor, Organizer that lets you schedule events, create to-do lists, save phone numbers and e-mail addresses, and more. 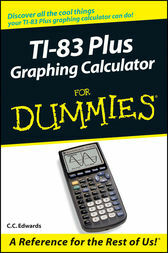 Get this book and discover how your TI-83 Plus Graphing Calculator can solve all kinds of problems for you. C.C. Edwards is an instructor at Coastal Carolina University. Previously, she was the editor of Eightysomething, Texas Instruments' newsletter that explored the features of graphing calculators for parents and educators.